Another example of Clover cleverly naming their remake of a familiar dish to avoid triggering quick judgment, allowing you to taste it for the first time on its own. 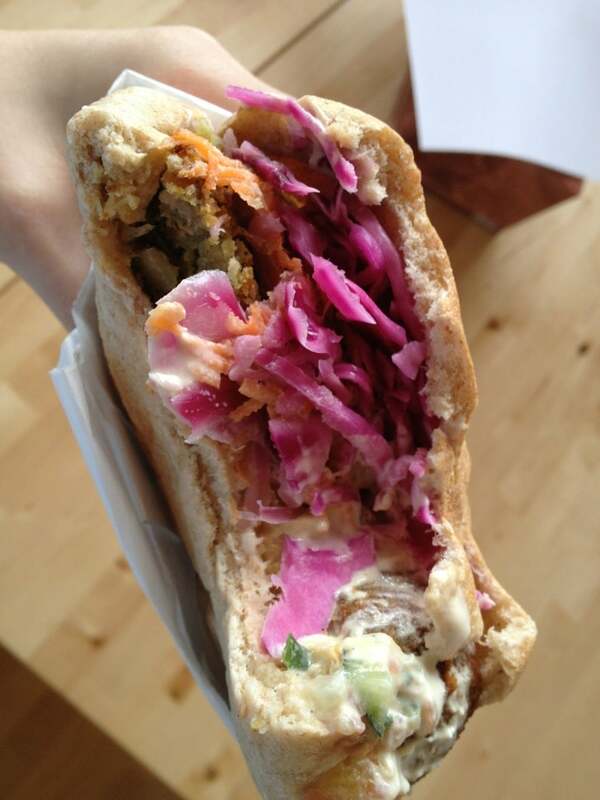 The chickpea fritter is essentially a deconstructed falafel sandwich on pita with hummus, cucumber-tomato salad, pickled vegetables and tahini. They're not trying to create the most authentic falafel out there, but instead one that's extremely healthy and delicious. Like other pita sandwiches from Clover, this baby is packed with enough ingredients (some of them with a lot of water content) that it will be bursting at the seams while you enjoy it. Keep it wrapped in the white paper, take big bites, and don't be afraid to lick your fingers when you're done. Oh, and don't forget the Rosemary Fries! via Foursquare / Linda Y.